Kickstarter funding might be a good fit for an independent artist making a big project like a movie. But on YouTube, there are many creators who dribble out new projects as they make them. Conte thinks it would be a better model for his superfans to support him by committing to pay for everything he does. Say, $1. 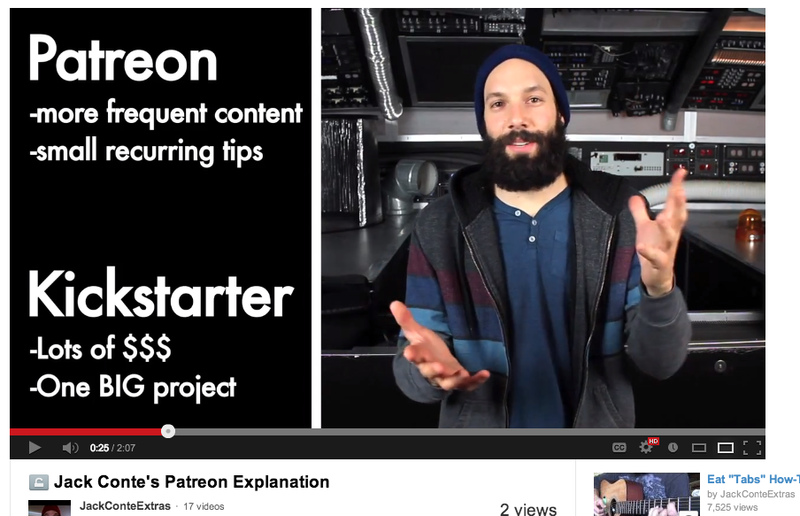 This isn’t a recurring monthly subscription; it’s a Jack Conte subscription. So he’s starting a new site, Patreon, that launches today, for himself and other artists. On the one hand, Patreon is yet another spin on crowdfunding that really only serves one particular form of fan-artist relationship. On the other hand, Conte is exactly that guy, and he thinks there are many more musicians, short filmmakers and bloggers like him. But wait a second, isn’t YouTube announcing its own paid subscription plans any day now? That’s totally different, Conte said, because it’s likely to be for premium networks and channels rather than creators themselves. It’s a way for YouTube to try to cut a deal with a Disney or an HBO, not a Pomplamoose. Conte argued that for independent artists like himself payments shouldn’t be mandatory; they should be an option. If he were to set up a pay wall, nobody would share his content. “The backlash would be awful. Talk about adding friction,” he said. And, on the other extreme, Patreon probably isn’t a fit for major stars, Conte agreed. If Lady Gaga or Louis C.K. were to ask fans to pay directly per new release, millions of people might sign up, and the Kickstarter-like transparency of Patreon would show just how much money they were making per new video. And Conte thinks that would turn people off at some high number. So is Patreon a tech startup? Conte — who built the site with ChompOn and OurSpot founder Sam Yam, who happens to have been his freshman roommate — said he isn’t sure yet.